Figure 1. 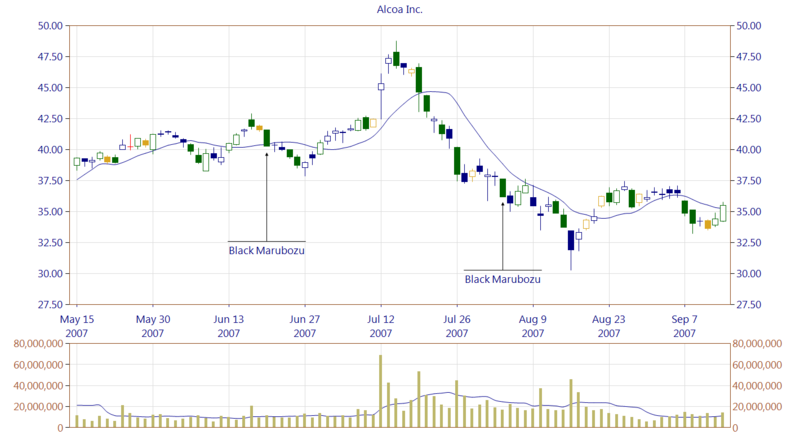 Black Marubozu (basic candle). The Black Marubozu belongs to the group of basic candles. It's an 'opposite' candlestick to the White Marubozu and, for this reason, has the exactly the opposite meaning. The lack of shadows means an opening at the maximum level and a steady decline in prices during the session, so its significance is very pessimistic as it indicates the strength and determination of the bears -- the bears controlled the market from open to close. Its importance depends on a broader context of a chart, as it may be part of another pattern, both bullish and bearish. 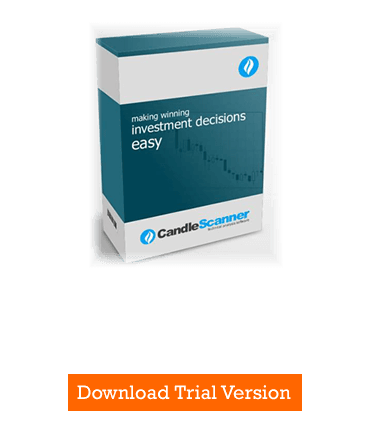 Shimizu points out that the longer the body of the candle this means even lower prices can be expected at the next candle. Morris, in turn, believes that this candle suggests the weakness of a downtrend. This interpretation may be surprising since, classically for the Japanese, it was a candle that had the largest importance, and not the shadows, hence, in this case, there is simply a day of clear declines. Morris argues that the candle is often found as the first part of a bullish reversal pattern. It is a bit of an odd remark, because for the White Marubozu he writes that it may be a continuation, as well as a reversal pattern. Bulkowski notes that the Black Marubozu as a continuation pattern is somewhat weaker in its significance than he White Marubozu, at least when it comes to the U.S. stock market. It seems that there has been a mistake -- Shimizu by writing that the candle is “particularly weak” meant that he expects a decline in prices. Morris interpreted this as a poor prognostic candle. Figure 2. The first occurrence of the Black Marubozu breaks the trendline. The second one is a continuation of a downtrend. Figure 3. 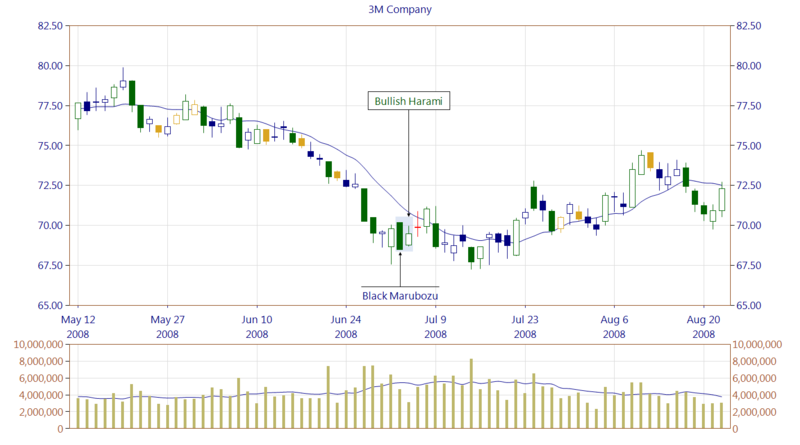 Black Marubozu occurrence in a downtrend as the part of the bullish reversal pattern (Bullish Harami).